Whether you are implementing SAP S/4HANA for the first time or migrating from an older SAP system, in order to experience the full benefits, you’ll need to get data correct the first time into S/4HANA. Best practices for your transition to S/4HANA. During the next few years, all the organizations running on SAP ERP will update their system from ECC to S/4HANA. This is a gradual transition that will happen in phases, and both architectures will be side by side for many months or even years. Winshuttle offers value to organizations at each phase of the transition: from the necessary system simplification when companies are just planning the project, to daily data management automation when all of your systems are finally running on SAP S/4HANA. 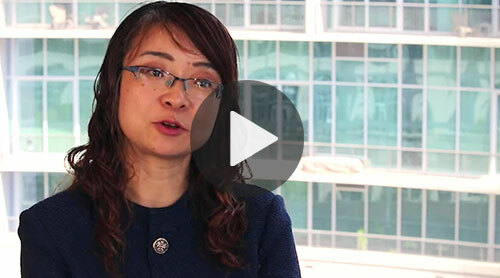 Map your journey with best practices, the right equipment, and advice from other companies. Winshuttle Studio allows you to migrate your master data or transactional data into S/4HANA and delegate migration tasks to the business users who are responsible for the data. You can easily extract data from your SAP ECC systems directly into Excel, where you can clean and manipulate data – and validate it against SAP before uploading into the new S/4HANA system. You can record transactions or use SAP tables or BAPIs to rapidly create robust and flexible data migration scenarios that can be used for ongoing maintenance activities long after you have gone live on S/4HANA. SAP recommends using your S/4HANA migration as an opportunity to validate existing extensions and modifications and simplify your solution. Removing waste and reducing custom code will enable you to eliminate additional work during the transition into the new architecture. 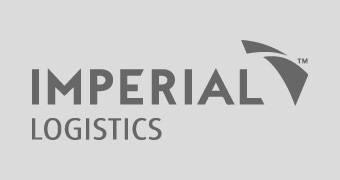 Winshuttle empowers business users to solve their own data challenges with a flexible and easy-to-use solution to reduce the amount of RICEFW objects (Reports, Interfaces, Conversions, Enhancements, Forms, and Workflows) across all SAP modules that require costly ABAP resources. Companies use Winshuttle as a more flexible and cost-effective customization layer to best prepare and execute S/4HANA migrations. 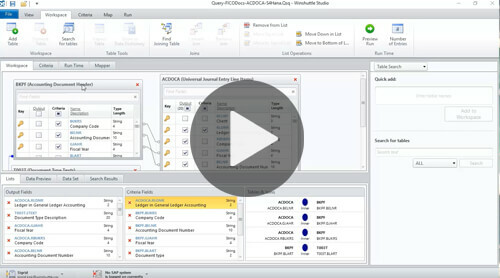 With Winshuttle Query, it’s easy to leverage S/4HANA’s new ACDOCA table. Learn how Scientific Drilling used Winshuttle to streamline their SAP S/4HANA implementation. Studio and Foundation provide robust and reliable ways for you to integrate external data from legacy systems and systems that don’t integrate with S/4HANA. Both the business and IT can use transaction recordings, BAPIs and queries to push and pull master data and transactional data from S/4HANA in real-time, accelerating application data maintenance and providing your organization with the right granularity of data according to business needs. Foundation can be used to augment interaction with S/4HANA from data contributors across the organization in a structured, managed, compliant and auditable way. Solutions developed for use with S/4HANA and Foundation support Excel and web-form based processes for master data governance scenarios for both single records and mass data loads. See how Winshuttle can help with your S/4HANA migration. 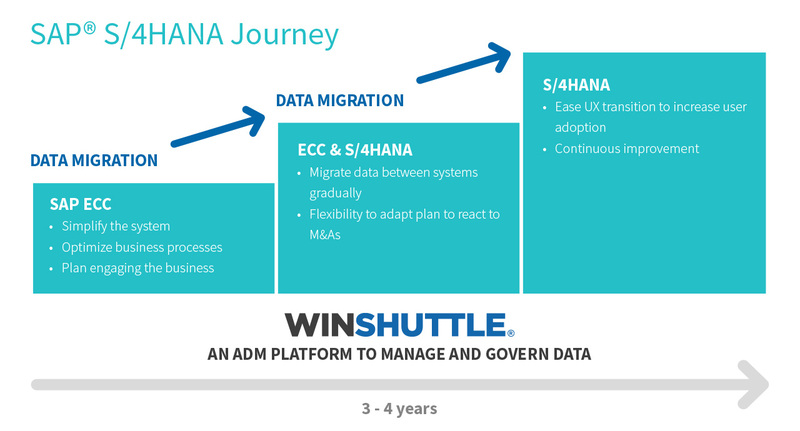 Plan a successful journey to S/4HANA with Winshuttle. Learn how to migrate your master data into S/4HANA using Excel. Learn how to automate data extractions, validations, and uploads to move data between ECC and S/4HANA. 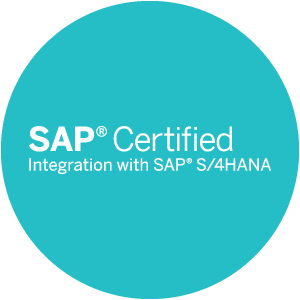 Both Studio and Foundation have been certified for integration with S/4HANA.